With the prevalence of SOA, an increasing number of Web Services(WS) are created and composed to construct Web-Service Based Systems(SBS). WSs are independent of formulation of complex business process by multiple WS composition. With the steadily growing number of service providers the competition becomes more and more intense. In order to compose a SBS selecting appropriate service from among a collection independently developed services with the same functionality but different cost and Quality of Service (QoS) properties is essential to meet the client preferences. The existing planning and selection algorithms are mostly designed for service discovery. To our knowledge, there are only a few works that incorporate service selection with respect to end user’s dynamic QoS requirements. Further, in case of QoS variation of composed SBS at provisioning-time due to QoS variation of one or more component services, a proactive adaptation strategy is required to maintain the required overall QoS. In this ongoing PhD work we propose complete, flexible solution for the “Dynamic QoS requirement aware automatic service selection and provisioning-time adaptation”. This approach is a graph based multi-grain clustering and selection model for service composition. 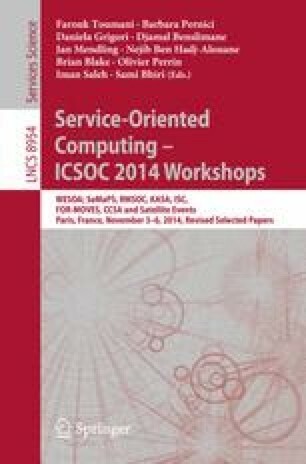 Initial version of this article had been published in “Work in Progress track of 21st IEEE International Conference on Web Services 2014: ICWS2014, Alaska USA” .